As a starting point you may wish to take some advice from professional bodies concerned with the management of business archives. Businesses are encouraged to seek help from public sector archivists on the storage and management of their company archives. The Business Archives Council is a professional association that represents the interests of owners, users and custodians of archives generated by businesses. The majority of its Executive and membership are company employees with responsibility for archives and records management. They host this website and are happy to respond to queries from companies uncertain about what to do with their archive collections. They can offer advice, training and networking opportunities. Contact Karen Sampson for more information. Specialist archives – for example those maintained within universities, museums and libraries, charities and associations – can offer help for companies with a specialist or regional focus. The links below provide further information and include the Find an Archive directory on The National Archives’ Discovery website. 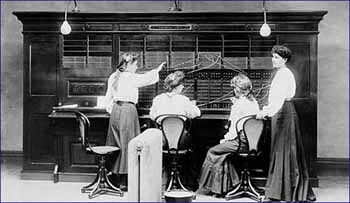 National Telephone Company switchboard operators. Image courtesy of BT Heritage.